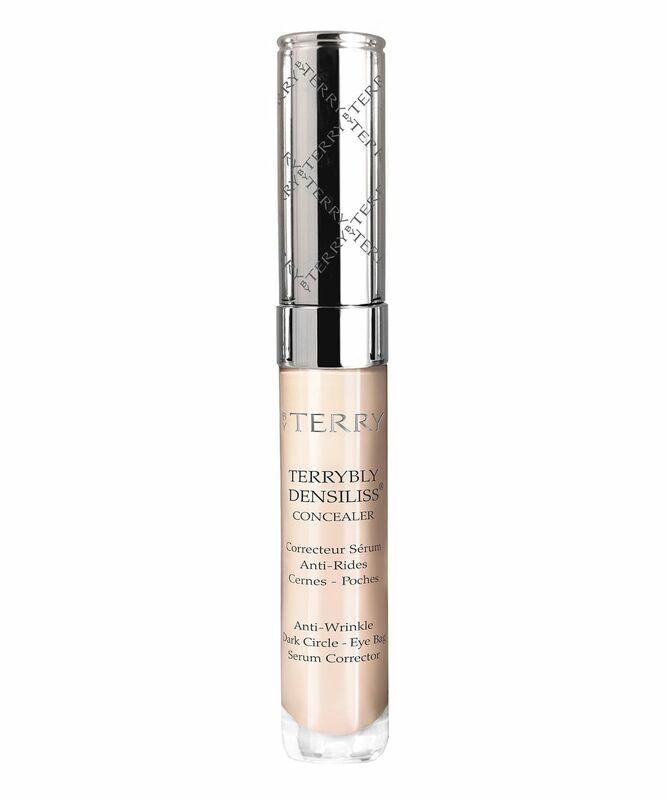 Perfect for all those concerned with early signs of ageing – fine lines, wrinkles, sun spots and other imperfections – By Terry’s Terrybly Densiliss Concealer perfects and corrects simultaneously. Enriched with ‘mimetic factor’ – which imitates the action of proteoglycans (essential for elastin and collagen synthesis), alongside the brand’s signature ‘flawless time control complex’ – a trio of unique powders which collaborate to smooth furrows, promote radiance and blur the visibility of blemishes – this featherweight, full-coverage concealer stars a convenient ‘doe foot’ applicator, and applies seamlessly to disguise dark circles and brighten the eye area, while actively firming and ‘plumping’ the fabric of fragile skin – counteracting tell-tale signs of fatigue for eyes that belie your years. Available in six illuminating, colour-correcting shades. Using the foam tip, delicately 'draw' out around the contour of the eyes - up to the arch of the eyebrow - without forgetting crows feet to 'fill in' wrinkles and disguise dark circles. Blend with fingertips or a brush, for a beautiful, satin-matte finish. The perfect concealer for dry skin. Amazing! This is my favourite concealer. My shade is number 5 desert beige and I would say I'm about a mac nc40-42 and it just blends beautifully, so light weight, doesn't cause issues with my dry skin. I frequently use it all over instead of just spot concealing and it's lovely and luminous. I highly recommend it, the only con as the other review mentioned I would say it's medium coverage at best and that it's slightly pricey. This is the first concealer that I can apply to the whole under eye area - I’ve tried many others but all seemed to just emphasise fine lines by sitting in them. This doesn’t, it just brightens the area with no downside. I can’t see that it would be any good for dark circles, though - it is very light coverage - and for the colour correction that I need just at the bottom of the under eye area, I still apply Nars creamy concealer because this stuff doesn’t touch it. As a general brightener/light concealer, though, it’s really great.